Anything that lets kids burn some energy is a serious win for any parent. Especially when that energy-burning item is directly in your backyard. The news of Vuly Thunder Trampolines is spreading like wildfire around Cincinnati and is worthy of your attention. Do you remember the trampolines from when you were a kid? I can recall countless times I, or a neighborhood kid, flew off the trampoline straight on the ground. The wind was knocked out of me more times than I can count. Or maybe you were jumping and all of a sudden, the bounce sprung you sideways and injured your knees. I even remember landing at the edge of the trampoline and half my body was wedged between the mat and the frame, intertwined with painful springs pinching my arms and legs. Well, folks, you are in luck because Vuly has designed a completely SAFE and GUARDED trampoline that has won the “Good Design” award for its flawless engineering. The Vuly Thunder Trampoline is here to stay and we can officially say “good bye” to the dangers of the past. What makes Vuly Thunder Trampolines so Safe? These trampolines are designed with high-end material without a single nut or bolt to hold it together. Your children’s fingers and toes are completely safe from being pinched, torn and mingled. Unlike traditional coil springs and rods, the newly designed leaf springs enable a perfectly upright and vertical bounce to ensure safety. This greatly minimizes the risk of a knee or leg energy due to a horizontal bounce that so many trampolines on the market enable. There is a tall safety net to make sure anyone bouncing and flying will remain inside the frame, as it is completely impossible to land on the ground. This safety net is equipped with a specially designed door that is easy to get in and out of, but closes right behind the child. You don’t have to worry about your child zipping the net up, or accidentally falling out this way, as it is very secure. My favorite feature of the Vuly Thunder Trampoline is the edge, or lack thereof. The mat and safety net is connected directly to the frame, meaning your child is safe to land ANYWHERE, even right up to the edge. No more getting caught up in those awful springs! What Unique Features and Accessories do Vuly Thunder Trampolines Have? For starters, the safety net is made of high quality material that is gentle on your child’s skin and even offers UV protection. To further protect your child from the sun, you can purchase a shade cover to attach at the roof of the trampoline. The Vuly Thunder Pro Trampoline comes with a safety skirt to go along the bottom of the trampoline. This keeps other children waiting their turn to jump from wandering underneath the trampoline and getting hurt from another child’s bounce. Then of course there are the fun things you can add on, like a basketball hoop. Your kid can spend hours in there shooting hoops and bouncing like Michael Jordan! An added feature is the twice galvanised frame that is weather tested in multiple scenarios. Rain, snow, wind, and sun, the frame will withstand it all. Your hard earned money will go towards a product that your kids will enjoy their entire childhood. Everyone knows being physically active is important, especially the older you get. Adults have to make a specific effort to get up and moving, whether it’s a walk around the block or a long run. However, parents often assume their children are getting enough exercise when they really aren’t. Did You Know that Many Elementary Schools are Cutting Back on Outdoor Recess? This is an alarming fact that is spreading across the country as fast as higher academic demands for both students and teachers. Children are not only sitting in desks or chairs all day, but are not able to run around outside, or in physical education, like they used to be. Because of these facts, it is even more crucial for parents to provide the physical activity their children need to grow and develop into strong and healthy teenagers and adults. Vuly trampolines can help in this department, making physical activity for you and your children fun again! Many adult exercise classes are being redesigned to include a trampoline in the workout. This is because using your legs to bounce and push yourself upwards is a quick way to raise your heart rate and build muscle density. What a better way for promoting a healthy lifestyle by installing a world-renowned trampoline on your property? According to the Centers for Disease Control and Prevention (CDC), children should be getting a minimum of 60 minutes of physical activity a day. 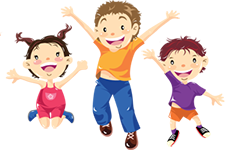 On top of this, children should participate in a vigorous-intensity activity at least 3 days a week. Even more specifically, the CDC recommends jumping to strengthen a child’s muscles and bones. Are you providing this for your children? A trampoline is the perfect solution to getting your kids more active. The CDC is not recommending you bring your toddler or young child to the gym to lift weights. They are simply stating kids need to be outdoors running, climbing and jumping. Kids need to just be kids and have fun instead of sitting in desks or on a couch. Mental health is a topic that is popping up on more and more people’s radar in the past several years. The increasing demands placed on children are partly to blame for the drastic increase in mental health illnesses that are being diagnosed across the country. The good news is can help your kids stay mentally strong with a healthy outlook on life just by encouraging them to stay physically active. Experts claim that physical activity can raise a child’s self-esteem, help them manage anxiety and depression, and even increase their cognitive skills. Run Jump-n-Play has Vuly trampolines on display at our giant indoor playground. Come check out our amazing products and you are sure to fall in love. The trampoline’s easy installation process, durability in all types of weather, and state-of-the-art safety features make this an easy decision. To make it even better, you will find that Vuly Trampolines are affordable and since they last a lifetime, you are making a great overall investment for your child’s health and happiness. Run Jump-n-Play also has Rainbow Playsets and Goalrilla basketball hoops to truly transform your backyard. We are a backyard superstore and can take care of any dreams or needs your family has. Spring is right around the corner. Visit us today to talk to a backyard fun specialist who can talk you through all of our great opens and get the installation scheduled in the books. We hope to see you soon!